If you have inadvertantly damaged your marble floor or counter top, do not despair. You can actually do minor repairs to marble on your own! Marble can be scratched or dulled by using acidic or abrasive cleaners. Also over time, marble can begin to lose it's luster. With a sanding sponge and some marble polish, you can polish up your marble floor or counter tops and having them looking shiny again. First choose a brand of marble restoration polish. 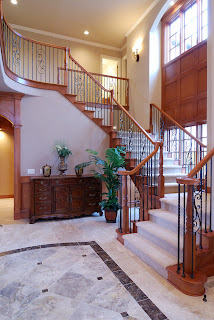 You can purchase marble restoration products at home improvement stores or online. Use the marble restoration polish only on marble that is dull and damaged. If you try to use it on a high shine floor or counter, you end up dulling the shiny finish. So be sure that you only do this on a damaged surface. Use your sanding sponge in circular motion with your marble restoration polish. The process is relatively quick and easy on a small area of marble floor or counter top. To polish marble that is not damaged, but just in need of cleaning, purchase a bottle of marble polish. It's very important that you only clean marble with marble cleaning products. Products such as Lundmark Wax Marble Polish, MarbleLife Marble Polish, or Stonecare Pro can be used at home for routine cleaning and polishing of your marble floors or countertops. Marble makes attractive and durable floors, countertops, and fireplaces for houses and office buildings. Marble and stone floors and marble countertops encompass one of kind designs along with the strength and durability of natural stone. Because marble is made by nature, it comes in many unique colors and combinations that are always one of a kind. You can rest assured that if you invest in a marble floor, countertop, or fireplace surround, that you are getting a one of a kind design. With that said, marble flooring can be durable and long lasting if properly cared for. However, if you make the mistake of using acid or alkaline cleaners on your beautiful new marble floor, you will realize how easy it can be damaged as well. If you are going to invest in marble, you had better do a little reading on how to properly care for it. Learning about your marble floor can save you a lot of headache and heart ache later is you unknowly use the wrong cleaner. Here are a few tips on marble care. 1. For everyday cleaning just use warm water. 2. Do not allow marble to air dry. It's prone to water spots. 3. For deeper cleaning use a marble cleaning fluid such as Marble Life's Intercare Cleaner. 4.Clean up spills immediately with warm water. Acidic spills like wine can damage marble. 5. Use a rug on your marble floor's high traffic areas. 6. Remove your shoes so that you're not putting unneccessary wear on your marble floor. 7. Have a professional seal your marble floor with marble sealer. If it's too late for your marble floor because you or maybe the previous owner has already done something to damage it, no worries. 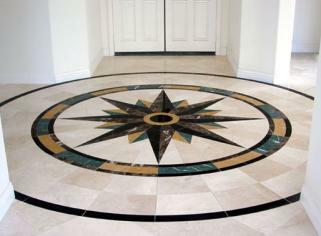 Marble specialists have the knowhow and expertise to clean, polish, color restore, and repair your marble floor.